Background Current general practitioner shortages need to be addressed, especially in areas of need. This study was designed to investigate which registrar characteristics were associated with retention in the field of general practice (and in the region of training). 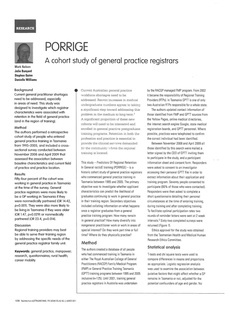 Method The authors performed a retrospective cohort study of people who entered general practice training in Tasmania from 1995�05, and included a crosssectional survey conducted between November 2008 and April 2009 that assessed the association between baseline characteristics and current field of practice and practice location. Results Fifty-four percent of the cohort was working in general practice in Tasmania at the time of the survey. General practice registrars were more likely to be a GP working in Tasmania if they were nonmedically partnered (OR 14.42, p=0.001). They were also more likely to be living in Tasmania if they were older (OR 1.47, p=0.029) or nonmedically partnered (OR 23.4, p=0.014). Discussion Regional training providers may best be able to serve their training region by addressing the specific needs of the general practice registrar family unit.